I decided to take the only direct flight from Kansas City to Miami because, you know, the uncertainties of changing planes anywhere these days can make you feel like a piece of lost luggage. The trade-off was that it was the red-eye – scheduled to leave at 6.15 AM. Unfortunately, the TSA lines were so long in our typically sleepy little airport, and the workers so disinterested in herding us through the machines that I missed the flight. The plane was still there on the tarmac, jet way connected, but the airline employee told me that I could no longer board because they had ‘weighed the passengers’ and calculated the fuel to the last drop. They then re-routed me via a connecting flight in the opposite direction. In Miami I was picked up at the airport by a friend who drove me through the snarled traffic (President Obama was in town), diverting through various parts of the city – the old, crumbling Miami that I remembered from my last visit many years ago, and the new version – all gussied up for Art Basel and Bobos. I stayed with another friend in a little Airbnb in Morningside. One of the chatty owners was a realtor who has been surfing the wave of gentrification in these historic neighborhoods. A folder in the living room proudly told the story of development in the area – including the delightful embellishments of Mimo (Miami Modernism) along the Bibo (Biscayne Boulevard). Did you know that there is festival in town called Cinco de Mimo? In the light of so many sunken treasure ships of Latinx culture that would make sense, right? Why am I telling you all this? Because it seems that there is no longer any way to escape the zillion little cuts of a dehumanizing, pre-packaged culture if you are just ‘passing through’ and refuse to go numb. Shaped by money and branded to compete, sold to the highest bidder and then protected from those who can’t pay for the goods, the public realm can no longer afford to be hospitable, real or vulnerable. It takes time to dig in, dig up, to feel uncomfortable and then craft some kind of hope. And this sets the stage for my experience at Common Field 2016. I agreed to write Version 1 of this review – even though I know I am slow at processing material and ideas and there was a quick turn around time for the article – partly because there was the possibility of earning some money. I had just received a notice from my ‘affordable’ health insurance that simultaneously doubled my deductible and out-of-pocket expenses and put my premium up to $950 a month. Growing older as an independent (art)worker is a dodgy business. The venerable not-for-profit art organization that I work for part-time can’t provide insurance or help with this crippling expense, and neither can my adjunct teaching position at another well-known art institution. As one of many in the field who hold what are now called ‘portfolio careers’, I also participate in an experimental educational project, have a collaborative public art practice, serve in civic settings and volunteer in my community. None of these brings in significant income and certainly no ‘fringe benefits’. It’s a dilemma so many of us face. We want to be paid fairly for work that we do, and don’t want to struggle to stay healthy or stress over what retirement will hold for us. Among the younger generation of artists and organizers, many are patiently improvising ways to raise and educate their children on a shoestring. In a recent Kansas City conversation about the role of the arts in gentrification processes Lynne McCormack of LISC suggested that artists can influence the progress of development by gaining ‘site control’. This apparently means owning property. Four years ago my partner and I bought a couple of old garages in a mostly vacant part of town, and have been strategizing constantly since then to remain outside of the ‘market value’ race – to create a viable space for experimental living, organizing and working. In the intervening years – scrabbling to make the buildings habitable and sustainable while staying on top of the mortgage payments – the landscape around us has transformed into an up-and-coming entertainment district. I go to neighborhood meetings, I stand up for the homeless who are being spit on, I protest the erasure of mixed income space to make way for luxury living and bars – but my voice has become less and less audible amidst the hammering of construction crews. On top of all this, there is no way to deny the fact that our venture into ‘site control’ has been backed by hundreds of years of accumulating privilege – colonialism that fed our country of origin, Fordism that ‘took care’ of our grandparents and parents, our race, education, networks… we inhabit a tangled mess of complicity, forfeit and resistance. Landing in Miami was like pressing the fast forward button for me. In this fragile city, the ecological impacts of unconstrained capitalism are rising through the ground as seawater. The sense of urgency mixed with hopeless resignation is overwhelming. I look at all the ways I personally succumb and conform to market pressures, despite my best intentions to discover other ways of thinking, being and doing. Failure informs but cannot define the person I am becoming. I have no choice but to create alternative visions, knowing that such restless actions do not just lead to change but actually embody the beginnings of something new among us. If I withdraw for more than a moment to reflect, if I yield without questioning or cease to imagine, then I become part of the machine that seals my/our fate into a blister-packaged future. My hopes for the convening were to connect with others who are similarly struggling to make sense of all this, to listen to their own ways of resisting, to learn better how to keep the conversation complex, open-ended and accessible, and to be encouraged in solidarity. Common Field was conceived as an exchange, but also as a kind of union that would build strength and provide a platform for advocacy. Though membership has been steadily growing, many radical colleagues, friends and mentors were not present at the convening in Little Haiti. This is not just the echoing “Why are we so white?” question. Many of those absent are artists and organizers who were invested in the stirring conversation that began at Hand In Glove in 2011 – the kind of dialogues that constantly challenge and grow collective ideas of what ‘alternative’ means. Where were they? Have they come to doubt the possibility – or value – of solidarity in our Common Field? The 2016 U.S. presidential election shook the world, not just by its outcome but by its corrosive processes. Those on the left of the political spectrum are crushed by grief, fear and outrage. We shudder to see so much progress towards a more loving society being ground to dust under the heel of a hateful boot. But we also have to acknowledge that Fascism thrives on dashed hopes, and that there are many Americans who feel abandoned by progress. We are now challenged to rebound with inventive strategies that will resist and overwhelm individual acts of violence, while completely reimagining a social structure capable of creating unity out of hostile diversity. This huge shift is part of our potential growth from human to humane. If we can do this, it will not happen in a moment. There will be no ‘master plan’. The more complex the world becomes, the more we need to talk, to argue, to struggle together and be energized by each other’s difference. It seems likely that models for new kinds of social structures would bubble up from myriad small experiments. Perhaps these might be shape-shifting federations that honor the small and local, platforms that specifically take apart privilege, or conversations that bridge between communities who have separated in order to heal and self-identify? Clearly, Common Field is a working experiment, and ideally one that will never be finished. The arts are inseparable from inventive processes – dreaming; proposing; risking; failing; editing; revising; abandoning; starting again. In my first version of this review I urged us to become an organization that values deep, slow and vulnerable exchange – even though I had rapidly and reflexively built a wall of words to hide behind. 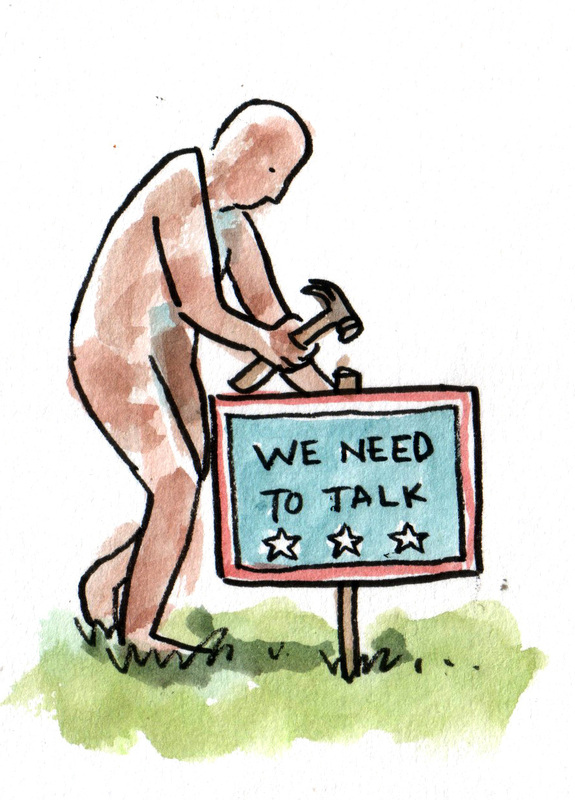 I’m taking a sledgehammer to the wall: Let’s talk, please. What kind of a collective body can truly help alternative arts organizations and spaces – if they want to not just survive but also remake an economically designed landscape; if they wish to operate with integrity, passion and inventive resistance? Can it lift us up as we struggle, and connect dissent with affirmation? Can it focus more on the future and less on the past, to respond more fluidly to the changing needs and constituencies of the field? Can it help me get health insurance? It would be wrong to diminish all the work that has brought us to this point, to forget the dedicated people who have labored on this beginning, or to deny the challenges that emerge when scaling a fireside chat up to a nation-wide community dialogue. It’s clear, however, that there is thoughtful work going on in the ‘how to’ arena, and that we could do better at defining purpose and building more inclusive processes. A feedback form may be a good beginning, but is it going to get answers from those who were not yet invited or are no longer in the room? What other forum(s) should we devise, to re-invent the way the Common Field might bind, sustain and challenge our particular and diverse community? How can we model an organization that reflects the future we wish to inhabit?